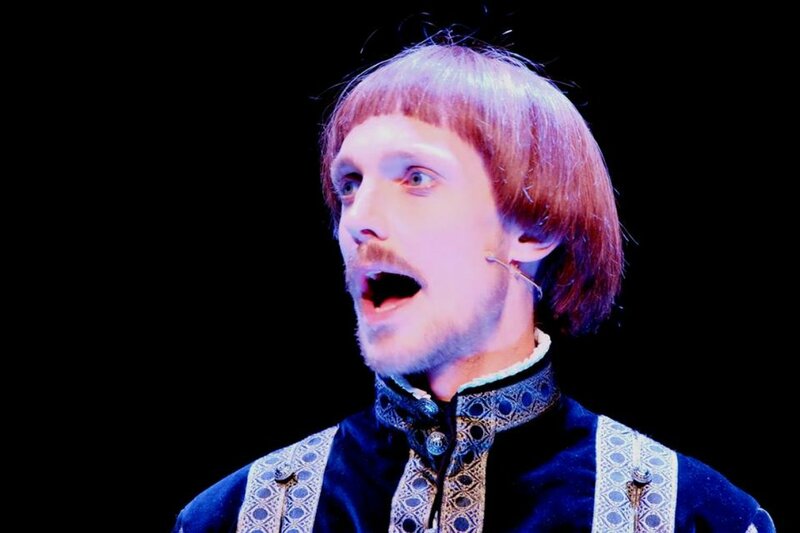 Espen Klouman Høiner as Hamlet at Trøndelag Theatre. We meet Espen Klouman Høiner in a full costume, yet he has no trouble being himself. Espen Klouman Høiner is not just an actor. He’s a graduate writer and has also been involved in the literary corpus 11, published by Aschehoug. Under Dusken meets him at Trøndelag Teater after a press showing of the play Hamlet, in which he plays the lead role of the Danish prince. Espen talks with a perfect Nesodden-accent, adding pressure to the key words in sentences, and immersing himself into every argument. It’s as if the actor in is always right underneath the surface. – I started a bit with writing, it has in a way always been there. It’s good to have both legs to stand on, and eventually try to melt them together a bit. I have written a play called Nesoddspelet, and set it up with my old class from theater school. We are an independent theater group, so we produced it this summer and last summer. I’ve written it, and we call it a “political-satirical musical comedy dressed up as a play.” A little more light hearted, although it has a serious tone underneath, he says. Espen admits it was fun, although he could imagine himself writing more serious stuff later on. About his relationship to film and stage he admits somewhat reluctantly that the stage might be closer to his heart. – Actually, I would not opt out of one for the other, but on stage we have more time and a greater collective responsibility for creating something together. And then there is often little better drama, the texts you work with are a little more complex, he says. The stage has an advantage in that if something does not work one evening, it can work the next evening, he points out. Espen thinks that an actor on stage has the ability to determine his or her own process. In a way, they become their own director and editor. – That is also why I think being on stage is delicious. One has a little more control over one’s own work, he says. Currently Espen is playing the lead role in Hamlet at Trøndelag Teater, and although he plays the lead role, he feels that he does not carry the piece alone. – I feel that we do it together, and it feels very good. At the same time I think it’s incredibly exciting, I feel extremely grateful and privileged to have been able to work with these extremely cool and complex things. It’s mostly a delight, he says with a smile. Espen has not played much Shakespeare previously, but was in productions of A Midsummer Night’s Dream and Twelfth Night when he went to Theatre School. – There I was also turned on by the drama. It is so precise, it involves so much and it feels so alive and relevant today. Although it was written many centuries ago! It’s a masterpiece, it’s a genius who wrote this, and you can really feel that. On a private level, I have read some of Shakespeare’s sonnets, and find them immensely poetic and beautiful. I have a very humble attitude to the texts. At the same time, that attitude disappears when I’m on stage playing a character in one of his dramas, cos then I need to look past all of that, he says. Trøndelag Theatre’s version of Hamlet is translated by André Bjerke and although Espen think that Shakespeare is still relevant today, he points out that they have not tried to take steps to make the play more relevant today. – But the relevance is there in Shakespeare’s fabric, and in the themes he brings up. It’s public, large and existential questions that people will always be concerned about. And then there’s something about this play, and Hamlet in particular, who opposes society in an era where it is rotten and corrupted. It is hard and cold, and he stands for a kind of humanism. He tries to overturn the established community that … what shall I say? Espen takes a break, looking for the right words. He talks fast and sometimes incoherently, it is obvious that this is important to him. – …is anti-human. I think that’s important today. We see how it is getting tougher among both our government and around Europe, and how we relate to refugees. Human life is being reduced, and we live in a hard time. Despite the fact that he became known to a very large audience as NTH-professor and resistance fighter Leif Tronstad in NRK-series The heavy water war last fall, he has a very relaxed attitude to his own celebrity status. – I don’t know which motivations people have to come to see the play, but I don’t think we have such wild conditions in this country and in this city that people pay to come to see me. I doubt it. But if someone does that – by all means, that’s nice, and then they’ll soon come to forget and realize that this is a completely different universe. But really I think they’re coming to see the play, he says. The series The heavy water war received some criticism for not being historically accurate. Espen says that the actors were quite prepared for it. – It will always be that way. The second world war takes up a lot of space in the collective memory of Norway and it’s very important for people that their stories are told in an accountable manner. We respect that very much, but it was a dramatization, not a documentary project. By such considerations one has to make some artistic choices, and of course we understand that people react, but we were pretty confident that we made the right choice for a dramatization. So we reacted quite nicely, he says. He also has no major plans to establish himself abroad, although he has a Danish agent and an American manager. Occasionally he gets offers, and has been in the US on a few trial shoots, but concludes that he has no great ambition or goal. I’m really enjoying doing the projects I’m doing here. If a cool project comes along, then I obviously interested, but I have no desire to go to Hollywood just for the sake of it. It is clear that being an actor means a lot to Espen. – What’s so cool about being an actor is that I am using myself the entire time, and obviously what constitutes myself is constantly changing. I discover new things about myself all the time, in the face of manuscripts and the theater. I think that’s exciting, because suddenly I’m at one stage in life and realize that this means a lot to me, then I’m somewhere else and discover that something else is important, he concludes.